Do you know the feeling when you know you are not ready for any new things, news of any kind, be it good or bad? Let me explain what it could be caused by: you do freelance work and you have taken on a new job a few days back, in addition to another one that you have had for some time. At the same time, in the middle of the day you get robbed, and your handbag disappears with credit and other cards, driving license, keys, etc. Then, your parents are coming for a visit in a few days time and your place needs some major cleaning in certain corners. Oh, and your husband is occupied at work for the whole weekend and you have two children to keep happy. Yet, everyone needs to eat. Instead of trying new recipes that could have potential to result in disaster, I cook and bake things that are tested and approved. Recipes whose ingredients I probably have at home at all times. 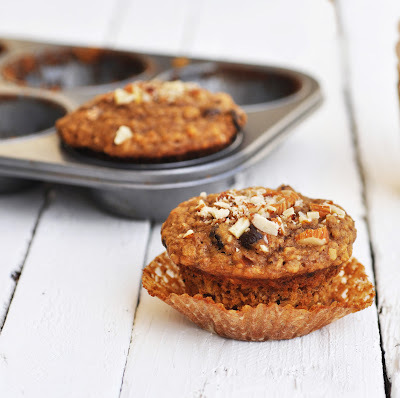 Like these Banana Molasses Muffins. I think, on 350 out of 365 days per year I'd be able to bake these without leaving the house. Muffins like these have several major advantages: they are whipped up and baked within 30 minutes. A healthy breakfast and snacks are saved for the next day. In food processor, grind oats and 3 tablespoons of almonds to a coarse meal. Transfer to mixing bowl and whisk in flour, baking soda, baking powder, and cinnamon. Stir in raisins. Chop the remaining almonds and sprinkle on top of the muffin batter. Bake 20 minutes, or until tops are firm to the touch.